It is winter snowing season again and it is the best time to experience snow and skiing at the Korean's world famous Vivaldi Park. Going from Myeongdong at downtown Seoul to Vivaldi Park is easy as well. With more than 10 slopes suitable for beginners to expert level skiing, Vivaldi Park is the most popular winter skiing destination near Seoul. NOTICE: Winter Round Trip Bus to Vivaldi Park starts on 1 Dec 2017 and ends on 2 March 2018. ONLINE BOOKING required. Do you know that there are free shuttle bus that take you from Myeongdong to Daemyung Vivaldi Park Ski World? This year in 2015, this free shuttle bus will start from 1 DECEMBER 2017 until end of ski season (2 March 2018). This roundtripshuttle bus service is specially provided for FOREIGNERS only. In other words, you must hold non-Korean Passport to enjoy this free shuttle service. NOTE THAT ADVANCE BOOKING IS A MUST. Read below for how to do the booking. WHERE TO TAKE THE FREE SHUTTLE BUS AT MYEONGDONG SEOUL TO TO GO TO DAEMYUNG VIVALDI PARK? The Bus Stop of Round Trip Shuttle Bus to Vivaldi Park is Located in front of Lotte Hotel Myeongdong, same bus stop as the Airport Limousine Bus. 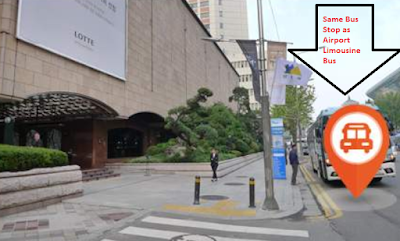 The bus stop for the round trip bus to Vivaldi Park is located at LOTTE HOTEL, MYEONGDONG. Lotte Hotel Myeongdong is located at 30, Eulji-ro, Jung-gu, Seoul, Korea Lotte Hotel Seoul. It is just 1 minute walk from EXIT 8 of Euljiro 1-ga Subway Station on Line 2. 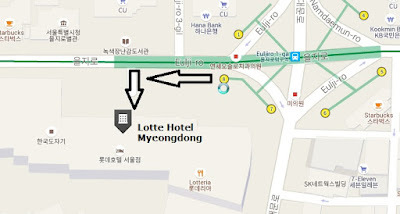 The location map of Lotte Hotel Myeongdong is shown below. There is only ONE free shuttle bus from Myeongdong to Vivaldi Park Ski World daily. 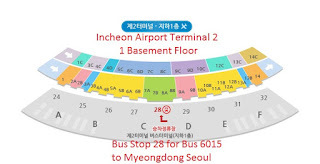 The bus depart at 8:00am from Lotte Hotel Myeongdong. Make sure you are on time (be at the bus stop10 minutes earlier to be safe). The bus journey from Myeongdong Seoul to Vivaldi Park will take 1 hour and 45 minutes. The estimated arrival time at Daemyung Vivaldi Park is 9:45am. You will have plenty of time enjoying skiing at one of the thirteen skiing track at Vivaldi Park. Since there is only ONE bus a day, advance seat booking for ski shuttle bus to Vivaldi Park is a must. It can be done through Klook Website for round trip bus reservation no later than 3 days before taking the bus. On the reservation website, Click on the Book button on the page. Then choose the Ski Package and then for the Shuttle Bus Pick Up Location, choose "8:00AM MYEONGDONG" as the station you will wait for the shuttle bus to Vivaldi Park. After that, fill out your basic information for your reservation. Once completed, you will receive your ski shuttle bus reservation confirmation voucher automatically. You can either print it or save a copy on your mobile phone so that you can show your reservation when getting onto the bus. Don't forget to bring your foreign ID or passport too because you need to show it when getting onto the bus. REMEMBER, BOOK YOUR SEAT THROUGH THE WEBSITE NO LATER THAN 3 DAYS BEFORE TAKING THE BUS. YOU CANNOT BUY THE TICKET AT THE BUS STOP AT LOTTE HOTEL MYEONGDONG OR ON THE BUS. Don't worry about returning to Myeongdong Seoul. Vivaldi Park provide the same free shuttle bus service for your returning journey. After enjoying your day skiing at the world class Vivaldi Park, you can take the shuttle bus back to Myeongdong Seoul. The shuttle bus departs Vivaldi Park at 6:00pm. The returning journey will take about 2 hours. Your expected arrival time at Lotte Hotel Myeongdong is 8:00pm. Similarly, don't forget to book your returning seat in advance as well through the website. Otherwise, you would have to stay overnight at Vivaldi Park (don't worry, there are very good accommodation hotel at Vivaldi Park if you wish to stay for a few days to enjoy the snow and ski). 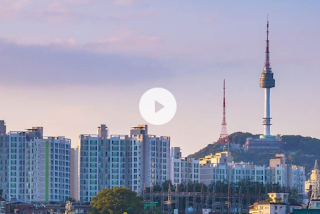 How to go from Myeongdong Seoul to Daemyung Vivaldi Park Ski World? In summary, just take the free shuttle bus at Lotte Hotel Myeongdong and you will arrive at Vivaldi Park in less than 2 hours. Remember, advance reservation for this bus seat through website is required and it is specially provided to foreigner tourist only. Don't forget to book your returning bus trip to Myeongdong. Enjoy skiing at Vivaldi Park before returning to Myeongdong for shopping and some warm Kyoja in the winter! Hello, thanks for the info, by the way, is it the nearest Ski Park from the Incheon or Myeondong? Thanks for your comment. there are other nearer ski park from Myeongdong, Seoul such as Jisan Forest Resort (about 40 minutes from Seoul). I introduce Vivaldi Park here because it is the most favourite place for skiing and snowboarding among Seoul People. In you have never been skiing in Korea, come and experience it at Vivaldi Park with Korea people. How much is it to ski in Vivaldi Park? It depends on how you want to ski. For example, if you want to spend your morning skiing at Vivaldi Park from 10:30am to 3:00pm, the fees for lift will be 58,000 won for adult and 41,000 won for children. If you want to rent the ski & snow board, then the equipment rental is about 26,000 won for adult and 18,000 won for children. So, in total, it will be about 84,000 won for a adult and about 59,000 won for a children. Is that only the cost we need to pay? Hi, from which subway station is easier to walk to Myeongdong Catheral? Thanks to advise direction. You can take subway to Myeongdong Station and then walk a few minutes to Myeongdong Cathedral. Any other attraction nearby vivaldi park?? You can visit Ocean World and Ocean Bay Themepark (water park) at Daemyung Resort Vivaldi Park. do we need to use the lift? ?cant we just ski around the bottom hill? ?or is it compulsory to used the lift? ?thanks in advance..
Hi, if we do not want to ski or snowboard, are there other activities like snow sledding or snow tubing? Hello, I just want to ask how much is the entrance fee and do they offer Basic ski lesson and rental in Vivaldi Park? I cannot find the fees and offers in their website. The entrance fee is about 60,000Won and the rental of ski and snowboard is about 30,000Won. You can check back their website in middle November when the ski season starts for up to date pricing for rental and lesson this year. I will arrive at Incheon Airport on Saturday at 8pm. What transport can I take to Vivaldi Park resort? I will leave the resort on Thursday morning. What transport can I take to Incheon Airport? On the Internet, one should learn to practice the correct etiquette. Asking for information without and sign of politeness nor gratitude is bad etiquette. It will get you no response as such "entitlement" attitude shows a lack of understanding that often the people providing you the information is doing it as a favor and they do deserve at least a "please", "thank you" or "may I ask". Enjoy skiing at Vivaldi Park! May I ask if we choose not to take the shuttle bus, can we get a taxi from Seoul to go to Vivaldi and back? We have 2 young children and big luaggage and would like to get back to Seoul earlier instead of taking the 6 pm shuttle. Thank you very much!! Yes, you can take taxi from Myeongdong to Vivaldi Park and return just by paying the taxi meter charge. Thank you for your reply, Chicken Share! We will be in Seoul tomorrow morning. Can't wait! I will be in Seoul during the Seoullal holiday. 1. I plan to go to Vivaldi Ski resort on Sunday, 29Jan. Will it be very crowded on tht date? Is the the traffic to & from Seoul be heavy? 2. I read some comments that it's difficult for foreigner to get around the park if going on their own (without tour package/ guide). Is it true? 3. Another thing, the free shuttle back to Seoul is at 6pm. Is there other public transport from the park that i can get on, besides taxi? In case i want to go back earlier. If I may ask, is there any other options to get from myeongdong station to the hotel besides taking the train? I understand that by taking the train I would have to transfer twice. Is it too far if I just walk from myeongdong station to the hotel? Do you mean walking from Myeongdong Station to Lotte Hotel Myeongdong? Yes, you can walk from Myeongdong Staiton to Lotte Hotel Myeongdong in about 10 minutes (depending on walking speed). Thanks for your good info from your blog. May i ask how much is the entrance fees to vivaldi ski part for morning sessions? I don't plan to ski just want to play with the snow :). If you don't plan to ski, you can choose the basic package which is KRW40,000. This package includes round trip bus transfer from Myeongdong, one time round trip gondola ride at Vivaldi Park and snow sled. Ski is not included in basic package. Thanks for your good info, but if i already booking the package from others website, how i can booking the shuttle bus? Thank you so much for your information. You blog is quite detail and helpful for us. By the way, I already check on their website but there is no information about the entrance fee and snow sled. To go to the sledging area, you can take the Gondola. This cost around 15$ for a return trip. Which you can buy at the resort itself. This link is quite good for information about Vivaldi Park. There is only one bus which will depart back to Seoul from Vivaldi Ski Resort. If you want to go back to Seoul earlier, one option is to take train from Baegyang-ri Station of Gyeongchun Line. Hi, when will the shuttle bus starts in December 2018 and the way to book it?